I am going to dedicate this whole week to breakfast delicacies. I have noted with concern that most people are willing to get adventurous with their lunches and dinners but not with their breakfast meals. So I am on a mission to make breakfast interesting for those who consider it the most important meal of the day. This is a simple recipe for eggs. – mix all the above ingredients in a bowl. – On a heated pan (on medium to low heat) add a tablespoon of oil and swirl the pan so that the base is well oiled. – scoop half cup of the mix and again swirl the pan to thinly spread the mix on the base of the pan. – Give it 30 seconds to just form a base so it can lift off the pan without breaking, but not done on the upper side. – Now oil the remaining part of the pan and add another scoope of the egg mix. Make sure it touches the last bit of the rolled piece in a way that it integrates like a continuous piece. – Give it 30 seconds then start rolling again but this time start from the side with the rolled piece. As you continue folding the piece will get bigger and bigger thus easier to roll. – once no more folds can be done, push it to one side and repeat the above process until the egg mix is finished. ** my tip: Do a maximum of 3 scoops including the initial one then put it aside and start the process again if you need more eggs- instead of trying to do a huge roll. A big roll is hard to manage which results in breaks and a resulting ugly egg roll. – when done, place them on a plate and cover it. Let them sit for 5-10 minutes before cutting the roll in to desired pieces/size. The wait allows the egg to continue cooking even after taking it off the heat, resulting in a perfectly cooked egg roll. 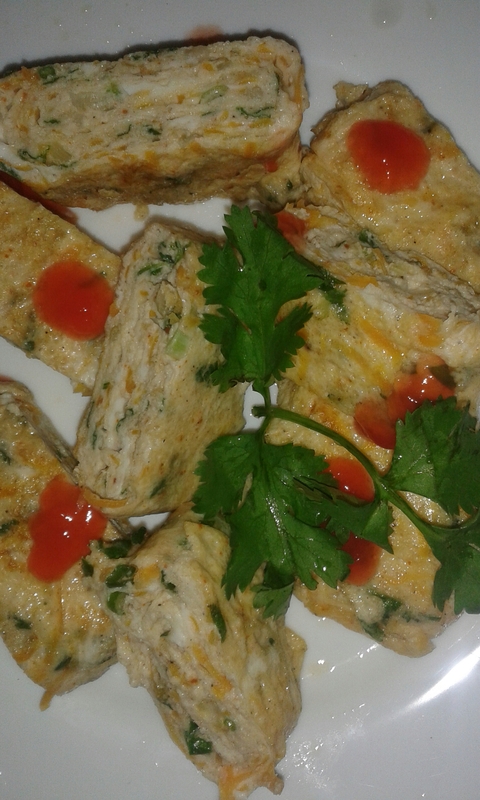 I love cooking my food,And since i saw blog i fell in love with it kwanza vile wewe ni mcoast hehe nwe Coastal meals my BEST. you always inspire me with your cooking mum keep it up. Inbox me we discuss this some more. On Facebook ask to join upishi zone or click the ‘follow’ icon on this blog. Hi. On Facebook ask to join a group called upishi zone or click the follow button on this blog. what of pizza? can you pliz give some tips on how to prepare?,this hotel guys are raking our pockets with our ignorance. did you take photos? Would like to see them. Good job! Looking at this just tortures my taste buds…yuuum! Am gonna give this a try. Hi. I will edit the post and include step by step pics.